Just under a month ago App.net launched it’s own Kickstarter style appeal. Give us $500,000 and we’ll launch a real-time social service where users and developers come first, not advertisers. This would be a paid for social network where user and developer concerns outweigh advertisers. This would be a social network unlike any others as you would have to pay every year to continue using the service. A paid alternative to Twitter. This all stemmed from the threatening and changing tone from Twitter. Where initially they wanted the support of developers (and indeed saw many features grow organically from the user community) over the last 6-12 months there is a definite change in how they work with third party developers and an increase in adverts. A service like Twitter doesn’t come cheaply so the adverts are a necessary evil for a free network. App.net promise an advert free network and fully open API. It sounded great but I was and still am sceptical. Will it attract the numbers required to make it useful? Will it become a walled garden? Will it get third party support? There’s a pessimistic/realistic post from MG Siegler that sums up many of the problems App.net faces. The idea still appeals though, hence I’ve signed up. I like paying my way on the internet if I get a better service. I pay for Flickr as it keeps it ad free for me and I still think it’s a great site despite the many free options out there. I pay for web hosting despite wordpress.com as I get more control over how my site works. I’m hoping that by paying for App.net that I’ll get rich conversations, I won’t have to suffer adverts and it should be spammer free – how many spammers and trolls wil pay $50 a year? I guess I also have expectations that may be difficult to deliver initially as it’s a brand new service up against the like of Twitter and Facebook, but if people don’t support ventures like App.net then we will forever be used to selling our privacy and data for allegedly free web services. Like many have said, I’d pay for a premier Twitter account if it could keep me advert free, gave me full search etc. I hope App.net succeeds but even if it doesn’t I’m hoping that it will at least jerk Twitter into providing a better service longer term. With three days to go it will be touch and go to get the $500,000 funding but they are progressing – the alpha is now live and the API spec is available on Github. Will I see you on App.net? By far Twitter is my most used and most loved social network. It’s simple, fast and let’s me talk to people easily. The 140 character limit, unchanged since day one of the service, is still it’s biggest plus point. With no room to ramble information is passed and consumed at a far denser rate than anywhere else. It also leads to the best snarks online. Launched almost six years ago the first Twitter was pretty bare bones. Web only, driven by texting and with a simple follow model it started slowly and didn’t really take off for another year. Like most social networks I signed up, played with it for a few days and then promptly deleted my account and left. Empty experience, most friends weren’t interested and I just didn’t get it. A few months later I re-registered and loved it. It had seen growth in the tech community, there were loads of people worth following and it had become a useful service for me. Twitter’s feature growth was driven by it’s early adopters. Hashtags, retweeting and @ replies were officially supported by Twitter long after they had become mainstream amongst users. Third party developers drove Twitters growth via some great clients. Twitterrific was one of the first on the Mac and then the iPhone. Twitter was much more usable on a phone (computer too) via an application compared to the website. Over the last three years there’s been quite the third party market in Twitter clients with many adding features that Twitter doesn’t support – searching, archiving, muting (user, client but by far the best – hashtag) and timeline syncing across devices. All the while Twitter has been focussing on growth which makes for a richer network and brings with it the opportunity to monetise. It’s the chase of the dollar that brings with it some fear. For many years people pondered how Twitter was going to monetise it’s service. Providing a service like Twitter isn’t cheap nor easy. How many fail whales did we see in 2008? It’s now pretty much rock solid despite it’s growth and that robustness has come at the costs of millions and millions of VC dollars. VC dollars that it now has to pay back. Last year on it’s developer group Twitter warned third party developers. More specifically, developers ask us if they should build client apps that mimic or reproduce the mainstream Twitter consumer client experience. The answer is no. If you are an existing developer of client apps, you can continue to serve your user base, but we will be holding you to high standards to ensure you do not violate users’ privacy, that you provide consistency in the user experience, and that you rigorously adhere to all areas of our Terms of Service. We have spoken with the major client applications in the Twitter ecosystem about these needs on an ongoing basis, and will continue to ensure a high bar is maintained. Fairly bleak and although very little has happened since then a post on the Twitter developer blog follows up on that warning. Ultimately, we want to make sure that the Twitter experience is straightforward and easy to understand — whether you’re on Twitter.com or elsewhere on the web. We’re building tools for publishers and investing more and more in our own apps to ensure that you have a great experience everywhere you experience Twitter, no matter what device you’re using. You need to be able to see expanded Tweets and other features that make Twitter more engaging and easier to use. These are the features that bring people closer to the things they care about. These are the features that make Twitter Twitter. I don’t need to see expanded tweets thanks very much and I’m sure the point of this post isn’t to tell third party dev’s that they need to show expanded tweets and Twitter cards. It’s adverts. It’s potentially cut down access to API’s. For me it feels like winter is coming. What makes Twitter Twitter is the interaction with other people. Talking, sharing and learning. It works on so many levels and has brought many people together. It breaks news quicker than any other network and for many has become a key tool…even a part of their life. Now it looks like Twitter is trying to close down on what others can do with their data. That’s the bit that annoys me though. It’s my tweets. It’s my data yet I can do so very little with it. So many people have put so much into Twitter yet can’t get any of that data back out. Over time Twitter have added more and more restrictions to their initially fully open API. The majority of users can’t see their full Twitter history. Searching across that amazingly rich data set is a joke. Why can’t I export my tweets? Why hasn’t Twitter addressed the spam issues that plague the network? These are all features the majority of users would benefit from but instead we have seen new features recently to view stories on Twitter and make it easier to drive traffic to other sites. Twitter has opened up it’s service, invited everyone along and is now trying to own it all for themselves. It feels similar to Apple, Flickr and Facebook’s motives but Twitter for years traded on it’s open access policies. The change in tone is jarring. I do hope this is just a badly worded blog post that is ambiguous in it’s message but I really doubt it. Already LinkedIn have removed ability to view tweets on their site and they directly referenced the Twitter post from today. When the post says “in the coming weeks, we will be introducing stricter guidelines around how the Twitter API is used.” what does that mean for TweetBot, Twitterrific et all? If it is all about the money bring in a paid for service. This tweet from Aral Balkan sums up my feelings in 140 characters. I’d rather pay to be Twitter’s customer than get it for free and be the product they sell to their real customers: advertisers. Twitter isn’t too big that it can’t fail. Myspace and RIM are two examples of companies that only a few short years ago were leaders in their own space. Be careful Twitter. Your next few steps could make or break your company. I dearly hope it’s not the latter. 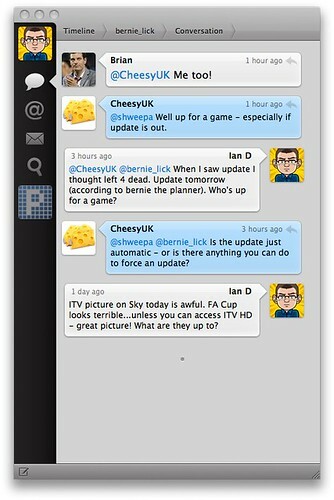 Tweetie for the iPhone has been my favourite Twitter client since it launched. Fast, clean and full of great functionality. I’ve never quite managed to find as good a client on the Mac though. Twitterific was the first good Mac client but it felt slow and lacking in features especially compared to TweetDeck and Seesmic Desktop. However both of those clients were Adobe Air based clients and always felt a wee bit sluggish, memory intensive and to be honest over featured for what I need. Thank goodness for Tweetie for Mac which launched today. It’s a client written specifically for the Mac and it shows. Great design, fast and clean with a great deal of functionality for a v1.0 release. Things I like? Images open not in a browser but in their own pop-up within Tweetie. Conversations are viewed in an iChat style like the image above. Search is quick and trends are easily available via the search bar. You can also create a new window to hold an individual search – keeps the screen clean and free of clutter but means you can see more if you really want to. Much prefer this over TweetDeck’s way of working which can feel really clumsy but there’s no doubting it’s power for major Twitter users. Shortcomings are really again only for power users. No easy way to group other Twitter users together apart form creating another Twitter account and using it to follow certain users. It’s a solution but not an elegant one. I’m sure future versions will offer some grouping support. I’ve set-up cmd+T as a new tweet shortcut so I can easily post from any app without finding Tweetie. I’ve also added a bookmarklet to Firefox which will create a new Twitter post via Tweetie of the current site your browsing. I used this bookmarklet instead of the one mentioned on the official site as it also posted the site title. One thing that did trip me up – cmd+return saves and send tweet and not return. Be nice if that was documented somewhere. Even after just a night of use I’m delighted with Tweetie so far. Good looking, quick and low on resource requirements. It costs $19.95 ($14.95 until May 4th) or is free with ad support. The ad’s are very unobtrusive although once my credit card is back in action I’ll be making a purchase. It’s app’s like this that remind me why I switched to Mac. Over the last few weeks there’s been a noticeable change while using Twitter. Not in the service itself although it has had a few hiccups which I haven’t really seen for months. No, it’s in the people using it. Non geeks are using it. Celebrities are using it. Heck, even the British press have found out about it and are now quoting it. Great. Well, I thought so. However I’ve read a few blog posts and tweets saying that Twitter has lost it, it’s jumped the shark, it’s time to leave, the world is ending, I don’t know how I can cope. The usual blogger faire. While you can’t stop people having their own opinions on this the bit I don’t get is Twitter, like all social networking tools, is whatever you want it to be. If you use to connect with friends then follow only them and keep away from the celebs, the news networks and the tech industry trendsetters that can be quite noisy. Don’t like someone’s tweets – unfollow them. I really don’t see what the issue is? I follow people I know in real life, bloggers that I enjoy reading, some of ‘the celebs’ who are actually conversing on Twitter (@stephenfry, @wossy, @bobbyllew ), some of the Mac community and some of the noisy tech crowd. At the moment this is giving me a great mix of tweets and I get a lot out of Twitter. The only real dislikes I have are the spammers that are trying to build massive networks and folk who keep on tweeting about their latest blog posts. It’s called RSS! Another aspect of Twitter that’s been discussed elsewhere is it’s news carrying worth. This week has had a few ‘popular’ news stories. The deaths of Patrick McGoohan, Ricardo Montalban (KAAAHHHHHHHHHHHNNNN was a fairly popular tweet) and then the Steve Jobs illness all exploded on Wednesday. I couldn’t believe how many people were tweeting on Steve Jobs as it broke, first questioning it, then confirming it and then adding their own comments. However those stories were nothing compared to the Hudson plane crash landing. Oh, and this picture. Taken from an iPhone of all things. Yes, the one with the crappy camera. Just shows that being in the right place at the right time is what really makes the difference. I’m a bit of a news junkie so having stories break and unfold in real time is very addictive. That picture was doing the rounds on Twitter while mainstream news sites were just breaking the story never mind showing pictures. It was the same during the Mumbai attack – Twitter and Flickr provided so much on what was really happening on the ground from people really affected. You just have to watch as people will take advantage and lie about what’s going on, making it difficult to separate fact from fiction. The Twitter picture made the BBC 10 O’Clock news yesterday and has been blogged about too by the BBC. The real question from mainstream media is around Twitter being a reliable news source? For me it’s as reliable as any blog (so take some things with a pinch of salt) and how do you determine if mainstream media is accurate? Would you say that everything in the papers is true? The Daily Record have been using Andy Murray’s tweets as the basis for a few articles recently, quoting that Andy ‘has told the Record’ where in actual fact he’s published a tweet. No doubt the Daily Mail will turn Twitter into some sort of national threat, a place full of shady folk doing shady things. A breeding ground for sexual deviants. What, you mean it’s not? Already the press are crawling over Jonathon Ross as in a tweet he asked for a word to drop in during the Bafta’s as if it’s oh so shocking and it shouldn’t be allowed. Sigh. Now that I’m tweeting regularly I don’t think I’ll be stopping any time soon – I enjoy it too much. It’s another tool to communicate with like IM, e-mail, blogs and forums. Just don’t believe everything you read and unfollow what you don’t like. Roll on my 1000th tweet.